When I searched for a new music player recently, I was looking for an inexpensive device with support for free formats like Flac and Ogg Vorbis. Ogg Vorbis support alone was enough to seriously restrict my choice. Serendipitously, however, the restriction of support for Ogg Vorbis resulted in me finding something much better than I was wanting. It is as though I were looking a car with the quality of a Hyundai, and instead stumbled across a Tesla for the same price. Fiio calls its X series of devices music players, and that is accurate, so far as it goes. However, the devices are really portable sound systems, capable with the addition of speakers and perhaps one or two other extras of being used as a home entertainment center, or of acting as external sound card for a computer. Even with files of a low sampling rate, the entry level Fiio X1 that I bought is making me rediscover my music collection, including some of the albums I have owned since high school. The X1 is designed to do one thing very well: play music. That means that many of the extras that other music players include, such as a radio and stopwatch, are not available in the X1. It doesn't even display the date and time. Nor does the device include any internal memory, requiring users to buy a micro SD card of up to 128GB for storage. What it does include is a cord for recharging and a complete set of music settings not found in other players, including a default volume, ReplayGain, Equalizer, and Balance. Add-ons such as a headphone amp are also sold separately. The emphasis on sound quality and control also explains why the X series of devices are the size of a smart phone, as I complained in my search -- at least twice the size of most music players. Digital to Analog Converters (DAC) that convert digital files into analog sound simply aren't made small enough to still deliver quality. 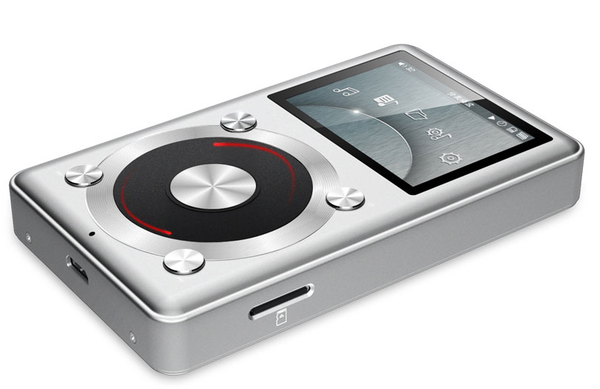 Instead of the plastic of most music players, the X1's case is brushed aluminum, contained in a clear plastic protective case and solid selection buttons. Press a button on the side, and an easy to use graphical interface displays for selecting music by file, artist, or genre, and creating playlists. The battery takes several hours to recharge, but lasts over than fifteen hours. The sound can be adjusted by the Equalizer, with several pre-sets like Rock or Jazz. However, I prefer to customize on my own. To my ear, the default is a little heavy on the bass and light on the treble, but that can be easily adjusted. What I appreciate is the overall clarity that brings out details that are completely missing from the same files on other players. I usually carry my music player when shopping or on transit, but even in such less than perfect surroundings, the sound is so clear that I find myself making excuses to use it at home as well. The X1 has some flaws, most notably the lack of a search function, the ability to jump through its lists instead of scrolling all the way, and the positioning of the buttons around the navigation wheel, instead of side by side. Probably the most serious is the extremely basic support for playlists, which cannot be renamed or re-ordered. But when the main purpose is fulfilled so well, I find tolerating such defects remarkably easy, and dismiss them as minor. I have not tried the more expensive devices in the X series, but apparently, while the X3 delivers comparable sound to the X1, the X5 and X7 each deliver a successively better sound. I can only imagine the results, but for now the X1 is enough to satisfy me -- and all because I wanted to play Ogg Vorbis files. Sometimes, supporting free software really is its own reward.